Ever have one of those days or SEVERAL of them when the enemy is just pelting you with everything he has and the pain is so deep you don’t know what to do? Late for work. Car accident. Sick kid. Fight with spouse. Rains on your outdoor plans. Over due bills. Surprise debt. The washer begins to leak. The children are fighting. Just one thing after another with no end in sight. Yup! Those are called fiery darts from the enemy. Things to keep us distracted and defeated. Ways of grabbing our attention to everything negative. 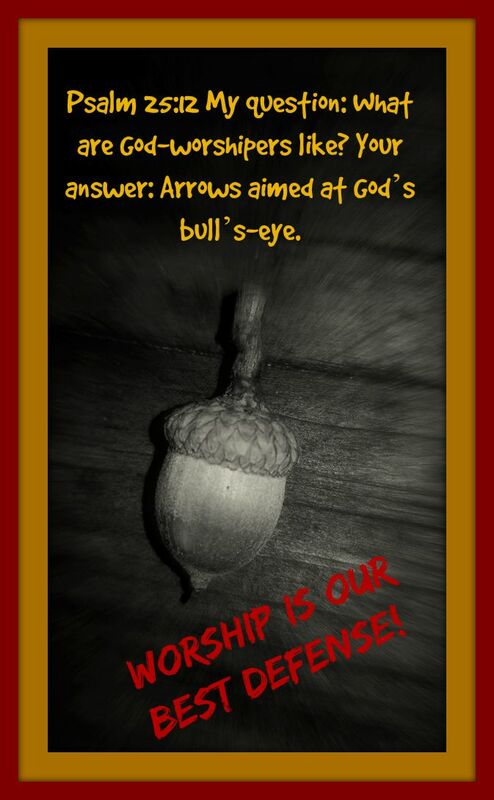 You may wonder why the title of this blog today is about acorns, well this is how God works for me. I am currently in a campground in Michigan and it’s officially fall and the acorns are coming down like a severe rain storm. It’s like living in the middle of a war zone and you are dodging bullets. Okay I may be exaggerating a wee bit, but they are coming down all around us. So this inspired me to speak about darts because this morning on our little texting group someone was under attack and I began to put two and two together with the acorn bombs going on around here. Everyday the enemy bombards us with arrows. Some of them are physical problems like our cars or appliances and others are mental defeats. We get so bogged down and bruised, battered and beat up over things that realistically we should be giving over to God. If we believe that it was all done at the cross then we must begin to understand that the devil has already lost the battle and he is doing his best just to annoy us and divert our attention. We need to learn to use the greatest weapon we have in our possession: WORSHIP. Okay, this may ruffle some feathers but just hang out with me for a minute. So how do we respond for instance when the car breaks down? Honest first reaction..anger, frustration, focused on the problem? Am I correct in most cases? We get caught up in the tragedy of the situation that we forget about the goodness of God momentarily. Not many of us think to praise or worship God in the heat of the moment of our car becoming unusable, instead we begin to speak at the devil or the object and we actually fuel the fire the devil is trying to get started. What happens when someone says a harsh word to us? Do we immediately begin to proclaim who God says we are or do we receive the sting of the words just spoken? Do get what I am trying to say? So often we embrace the negativeness of the issue before we even think about applying God to our situation. We get so caught up in the injustice of what is happening we forget we have the best ammunition in the world! Praise and Worship! If we could only wrap our minds around this we could begin to see positive actions in the fiery darts and send them right back to the enemy. If the definition of worship is to honor then we need to address the situation right away with honoring God. Thank Him for the car. Thank Him that He is sending help to fix it. Thank Him for being your provider. When we do this we ignore the enemy and eventually get to the point were we don’t notice the darts as attacks but as opportunities rather to honor God. Lord, teach us today the power of worship. Let us begin to flow with praise and worship in any situation. We acknowledge Father that You are our provider and the devil has no business messing with us. Today we choose to praise and worship in every situation which arises which comes up in our lives. We go into each day with our heads held high and our shields of worship raised. Thank You for loving us and taking such good care of us everyday. In Jesus Name we pray. Amen.